left to right: Jacqueline Wassen, Anna van Stuijvenberg, Sarah Buist, Wim van Egmond, Geeske Harting, Jessy Rahman. EMCO, a London-based performance artist, had the idea to create a festival of performance as part of the annual Bermondsey Carnival in Southwark Park, London, U.K., and invited me to participate. 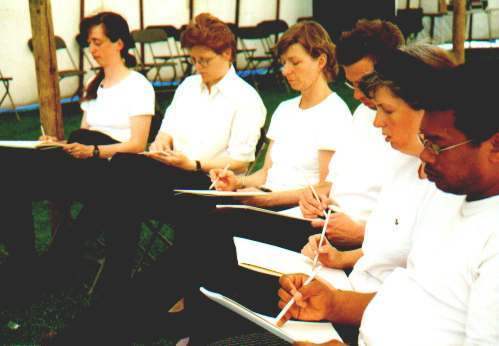 InterAction evolved into a series of performances and installations by 25 European-based artists in and around the park and the Cafe Gallery over a five-day period in May 1999. 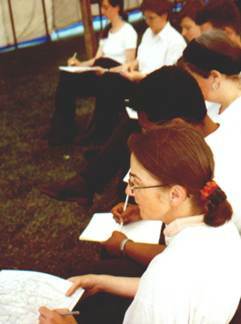 EMCO wanted a program of performances in a marquee aimed at a larger audience, to make the festival more visible and accessible to a general audience. Our ideas for 'The Living Creature' performance were more of a durational nature: perfect for the rose gardens but not for inside a tent in the midst of a noisy carnival. So we devised the 'Tabula Rasa' performances in response to EMCO's request. 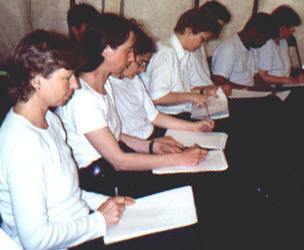 Sarah Buist, Geeske Harting, Wim van Egmond, Sonja van Kerkhoff, Jessy Rahman, Anna van Stuijvenberg & Jacqueline Wassen. We walked one by one into the space that had been the 'stage' for the previous performance and placed a row of chairs in a half-circle from the centre to the side. 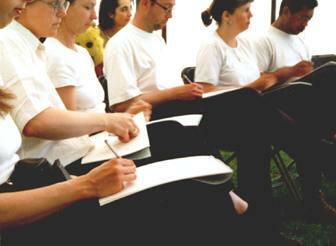 Then we each sat with a drawing pad and a pen and proceeded to draw the audience. After some silence, some laughter; after the expectation that something would happen, passed, people stood up and either walked away or walked around us to see what we were drawing. Sitting, concentrating on what went by and drawing, was what we did. We were reversing the usual audience-performer relationship as well as dispersing the binary passive-active relationship. The audience watched us. We observed them. front to back: Sonja, Jessy, Geeske, Wim, Sarah, Anna, and Jaqueline. And some joined in. These boys sat next to us and asked if they could draw so I gave four of them a pad and pencil. Initially I wasn't sure how to respond to the boys because they didn't seem to be really interested in participating, but I was wrong. Most did sit and draw and one remained for about 15 or 20 minutes to draw what he saw in front of him. Generally the public silently walked around us, observing us, observing them. Our intention was not to interact but to reverse the gaze (-as artists doing our job). Our pages, our 'Tabula Rasa', became filled with images of the public who passed before us. Click on the image for a larger view of the drawing. Then click the x on the top right to close that window. Although the idea here was a simple one, to sit and draw in a tent, in a carnival, my aim was to touch on various issues. "Tabula rasa" (=blank page) was a term the British Imperialist Philosophers of the 1600's used to describe the view that we are all born 'empty' or 'neutral'. So in filling these pages with impressions of what we were observing, our diverse visions were obvious to any viewer. My aim was not to raise questions for absolute answers in a direct way (just as the performance wasn't focussed on direct interaction) but to raise these sorts of issues obliquely and while remaining accessible. It was easy for people to see what we were doing. We were drawing them. And recognizing that, that gave 'space' for people to come closer to what we were doing on other levels. We heard people (often over our shoulders) talk about the drawings first by making comparisions and then talking about these comparisions. Others related to us by their facial expressions of being watched, and sometimes observing this, sometimes posing for us, sometimes walking away and other times walking around us to see what we had drawn. And two members of the public sat down to draw us! It was important that this piece went on for a whole hour so that the initial "audience-public" dualism created by the way they had been sitting for the previous theatre-like performance, could be dissolved. 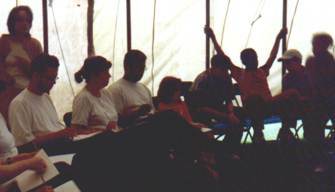 Not only because then often when people wandered into the tent they were unaware of what we were doing until they had been drawn by one of us but so it was easier to approach us or walk around us out of curiosity. The piece worked best when people gradually became aware of what we were doing. Often a smile of recognition would show on their face followed by moving towards us to see what we were drawing. Also for us, as performers, after some time the act of drawing became meditative rather than performative. It wasn't a matter of just sitting and drawing what was in front of us because after some time we had to choose whether to continue on that same page or that same view. So rather than being a drawing exercise, we were forced to think about when we decided our page was full or about whether to shift our perspective or way of drawing or not. Also over that period of time I found that my hearing sharpened and noticed that I used hearing more as a way of recognizing what people were doing in the tent area while my visual perception was preoccupied with remembering and translating details. 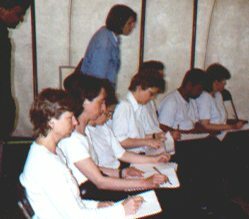 About the InterAction Festival, May 1999. The Living Creature exhibition in the CafeGallery, Southwark Park, London. A website about the Living Creature artists. The Living Creative performance in the rose garden. An installation made a month later incorporating the "Big Ones"
and "Small Ones" works in an old archival building in The Hague.